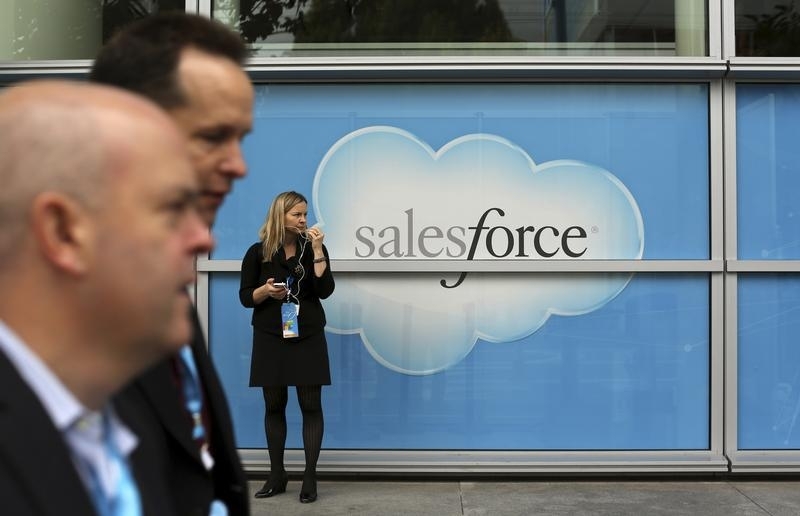 Salesforce.com’s slowing growth makes this a good time to seek a suitor. The $47 billion software outfit is on the market, according to Bloomberg. Oracle and Microsoft are looking to beef up cloud computing operations, putting them in the forefront of possible buyers. Founder Marc Benioff has been offloading shares steadily, and persistent losses and disappointing revenue growth could tempt him to hawk the whole thing. Cloud-based software has a lot of advantages. It’s quick and easy to navigate and doesn’t take a lot of upfront capital to put into operation. Updates are readily available, and boosting capacity and the number of users is typically a cinch. No wonder Salesforce’s market value has increased 20-fold over the past decade. Yet the company’s professed valuation of more than 100 times estimated adjusted earnings for this year looks like a stretch. According to standard accounting principles, Salesforce is bleeding red ink, losing $263 million in 2014 alone. Investors nonetheless seem to have plenty of faith in its ability to grow and eventually rack up a huge profit. The problem is that analysts expect growth to slow to a rate of 21 percent this year, about half the rate of several years ago. To some degree, that’s a natural result of getting larger. But investors will soon want to see the company start making money, and that’s a lot harder to pull off than revenue growth. Benioff may be thinking that a sale is a better option. He has already peddled more than $800,000 worth of shares on almost every trading day over the past few months, and a chunky premium could tempt him to get out altogether. The more interesting question is who would purchase the company. Oracle and Salesforce have had a famously contentious relationship, Microsoft is hinting that it may take an enormous write-down on its overpriced acquisition of Nokia, and a cross-border deal of this size could present difficulties for SAP. All Benioff has to do, though, is find one purchaser – willing to pay a hefty price. Salesforce.com is working with advisers to field takeover offers after being approached by a rival, Bloomberg reported on April 29. The company’s shares rose 12 percent in value on the news, giving the online software firm a market value of $47 billion.